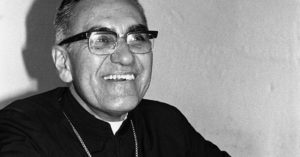 This Sunday, 14th October 2018, at a ceremony in Rome, Pope Francis will officially recognise the sainthood of Oscar Romero, Archbishop of San Salvador. It is a fitting tribute to an extraordinary man, whose life still influences the work of Trōcaire and similar organisations working for human rights around the world. Archbishop Romero was a great friend of Trōcaire. His leadership, conviction and compassion still guide Trōcaire’s values of solidarity, participation, perseverance and courage in our work today. In 1979, we began funding the El Salvador Human Rights Commission, which was set up by the Archbishop, in response to the unlawful killing of 8,000 people. Trōcaire received a letter from Monsignor Romero dated 1 March 1980 asking for funding to restore the broadcasting unit. He wrote “Not having the radio deprives us of a means so important here”. He also wrote in the same letter “I would like to thank your kindness and preoccupation for our country and our Church and the kindness of the Irish Bishop’s Conference and Trōcaire’s”. Two weeks after writing this letter, Archbishop Romero was brutally murdered. Archbishop Romero’s death was not in vain. Today his legacy continues to be deeply embedded in the work of Trōcaire. Have the Prayer of Oscar Romero attached to be printed in your local Parish bulletin or to be placed on your parish noticeboard. No programme accomplishes the church’s mission. We plant seeds that will one day grow. an opportunity for God’s grace to enter and to do the rest. We are prophets for a future not our own.